Former lawyer Nicole Fitzhenry-Dawes’ week is off to a rough start. Her mom showed up from Virginia for an unannounced visit, there’s a particularly virulent strain of the flu going around Fair Haven, and her friend Mandy discovered blood in one of the guest rooms of her bed-and-breakfast. With Mandy’s livelihood at stake and half of Fair Haven’s police department out sick, Nicole and her mom end up engaged in their version of mother-daughter time—investigating a murder. The case might prove to be one of the most challenging they’ve faced. The victim’s body is missing. The evidence points to all his co-workers, none of whom seem to have a motive. And Mandy’s attempts to help look a lot more like meddling. But just because they don’t have a firm lead on who the murderer is doesn’t mean the murderer doesn’t know them…and everything they fear. 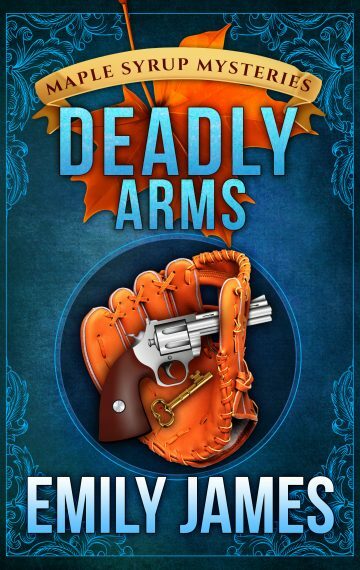 Deadly Arms is the fifth book in Emily James’ Maple Syrup Mysteries. If you love small-town settings, quirky characters, and a dollop of romance, then you’ll want to buy this new amateur sleuth mystery today!